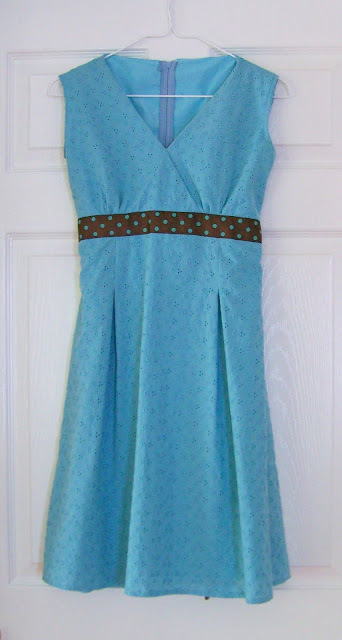 You may recall seeing this dress that I made for my older daughter’s spring concert a number of years ago. 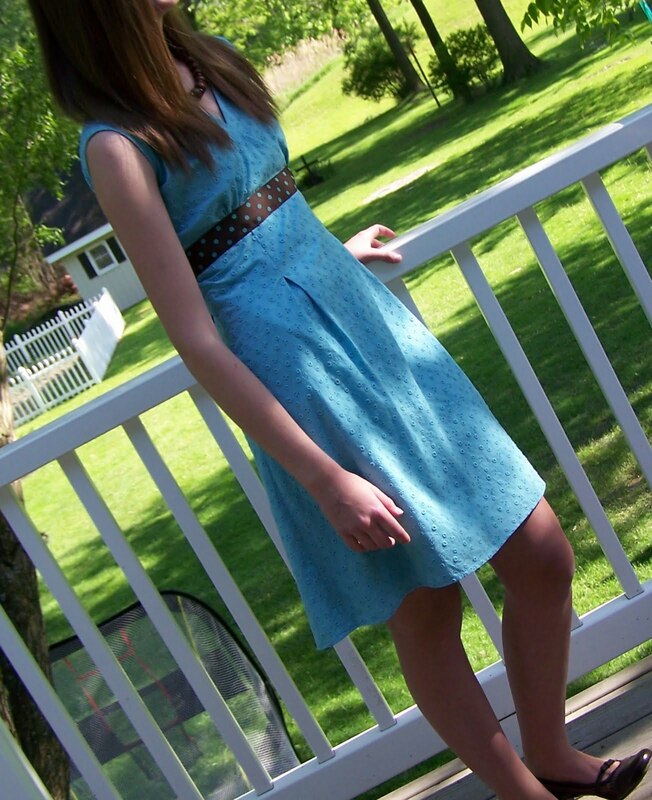 She was probably 14 at the time and eyelets were big (think “High School Musical”). This was probably more my choice than hers, but we wanted an appropriate dress. I believe she also wore it for her 8th grade graduation. Have you tried shopping for dresses with a 14 year old? The dresses out there don’t pass my “church meter.” Many of the girls choose strapless or dresses with spaghetti straps which they are then required to cover up with a sweater. Fast forward a few years. Annie will be soon graduating and making her Confirmation. Being the thrifty girl that I love, we purchased a dress for Easter that she is also going to wear for her graduation. (I know, it’s awful that I BOUGHT one….I guilt over things like this for months…) She then raided her sister’s closet and paraded a number of dresses in front of me as options for Confirmation. There were many huffs and puffs….the turquoise dress was the only one I felt was appropriate. She relented, but came back the next day and asked if we could tweak it. It did appear a little frumpy on her. I took out two inches at the shoulders, lopped off four inches or so of the hem, and removed the sleeves. We kicked around a few options for the sleeves, but decided to simply go sleeveless. I took the easiest route on this last option. I serged the edges, tucked under and stitched. No facings or bias tape. I think Annie was right. The dress has a much more updated feel to it. It is still “church safe” and yet I can see her wearing it as a sundress this summer. Never underestimate the power of a young woman! I really love the alterations you made to this dress, Jane! It’s certainly appropriate and suits her beautifully. Much better! It was cute before, but now it’s much sleeker and more flattering. Great job! Adorable, great changes. I love the color! My oldest daughter was so inspired by your T-shirt bracelets that she is making them like crazy! Thanks for the inspiration!! The altered dress looks so pretty on your daughter. You did a great job updating it for her. beautiful eyelet dress for your daughter.